Fresh out of the University of Southern California, Stu Pederson found himself with the single-A Lodi Dodgers, hitting a home run in his first at bat. Now, Lodi was looking for the California League championship, the five-game series tied 2-2, in an account in the Lodi News-Sentinel. Lodi had battled back from a 3-0 deficit in that game five, finding themselves tied at four with one out in the bottom of the ninth. Pederson came to bat. He fouled off pitches until the count was 3-2. He then parked the next one over the wall as the Lodi Dodgers walked off with the 1981 California League championship. "I knew he would challenge me with a fastball," Pederson told The News-Sentinel during the celebration afterward. Pederson was drafted by the Dodgers, taken in the ninth round of the draft. Lodi was his first destination. It would be a career that would span 12 seasons, and one where he would make it to the majors only once, for eight brief appearances. 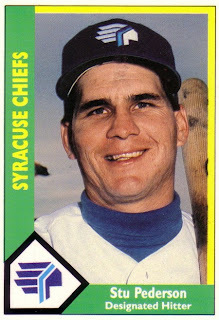 Pederson made AA San Antonio in 1983, then AAA Albuquerque in 1985. It was in September 1985 that Pederson got his call-up, to the Dodgers. He appeared in eight games that September, getting to the plate five times. He scored one run, batted in another, but never got a hit. Pederson stayed with the Dodger organization through 1987, then signed on with the Blue Jays system. He would never make Toronto, but he did make a name for himself. Already in his eighth year of professional baseball, Pederson started the year at AA Knoxville, then got the promotion to AAA Syracuse. It was the place where Pederson would play the rest of his career, part of that year and then four more full seasons. He would also later try his hand at replacement baseball in 1995, according to a Google News Archives search. Pederson would quickly become a fan favorite, his first name making for easy acknowledgments from fans, chanting the long form of his first name as he was announced: Stuuuu. He would also get a curse named after him, though the details of the supposed curse are unclear. There was an extremely short-lived blog dubbed "The Curse of Stu Pederson." Another blog referenced the curse, suggesting it related to the last time Syracuse won a championship, though the date, 1976, would suggest otherwise. Pederson returned in 2004 to throw out the ceremonial first pitch in 2004.